In a lot of ways, the latest iPhone is radically different. Apple has left virtually no component untouched, with the home button no exception. The old-school mechanical “click” mechanism has been replaced with a solid-state one. This uses Apple’s “taptic engine”, and contains no moving parts. This change was one of the many taken to give the phone its IP67 waterproof rating. But there’s another major advantage to it. 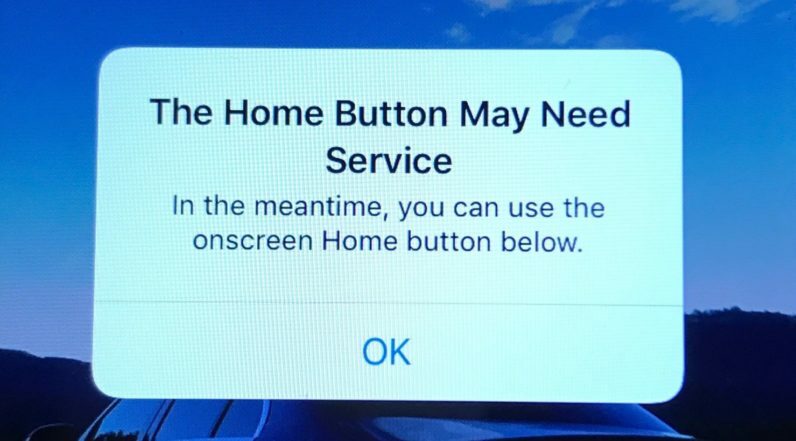 Now, when iOS’s diagnostic software detects something has gone awry, it will inform the user that the phone may need to be serviced. In the meantime, the user can use an on-screen home button. You can see what this looks like below. MacRumors forum member iwayne noticed the feature after the haptic engine on his iPhone’s home button started misfiring. The notice appeared after it turned off while charging. When iwayne restarted his device, the home button worked for a brief moment, before “firing 3-4 times in a row” every time he pressed it. He restarted his device again, after which it stopped working entirely. For those with defective phones, the on-screen home button is a welcome feature, since it means that the device can be used in the interim period. It may also be a sign of things to come. Rumors abound that Apple may replace the home button entirely on the iPhone 8, in favor of an on-screen one.